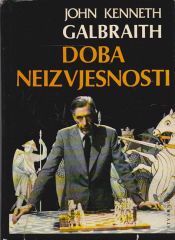 John Kenneth Galbraith OC (October 15, 1908 – April 29, 2006), also known as Ken Galbraith, was a Canadian-born economist, public official, and diplomat, and a leading proponent of 20th-century American liberalism. His books on economic topics were bestsellers from the 1950s through the 2000s, during which time Galbraith fulfilled the role of public intellectual. As an economist, he leaned toward post-Keynesian economics from an institutionalist perspective.